Like the hairs on your head, this ministry’s days are numbered (Luke 12:7). In 12:29, Jesus advises, “Seek not what ye shall eat, or what ye shall drink, neither be ye of doubtful mind.” Such wisdom applies to ministries as well as to individuals. God willing, our outreach will prosper until the Rapture, after which it will leave a vast legacy of edifying, Bible-teaching materials. For those who remain after Believers (“Believers” is short for “believers in Yeshua/Jesus as Messiah.”) are “caught up” (raptured) to be with the Lord, our office’s inventory will be a motherlode of Biblical books, Zola Levitt Presents DVDs, Jewish-Christian Institute lessons, Zola’s music CDs, Bibles, maps of Israel, etc. 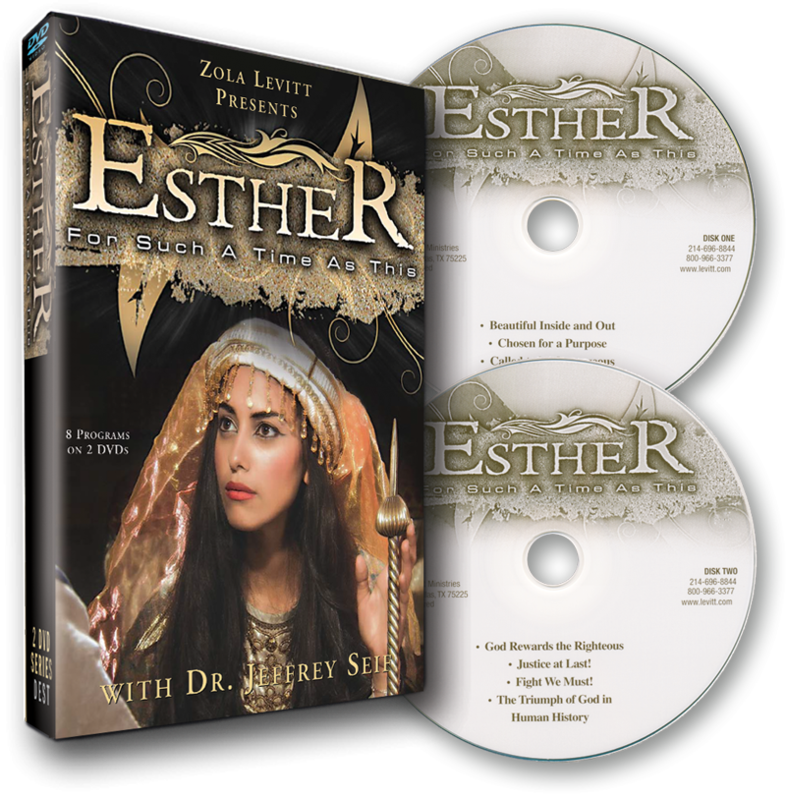 During the Apocalypse, our archived TV programs and Levitt Letters at levitt.com could lead a hundred or a thousand times as many souls to Yeshua as our storehouse of hard-copy resources. From 1978–2006, my father (Zola) was this ministry’s primary spokesperson. Dr. Jeffrey Seif and Sandra Levitt took the helm from 2006 until 2011, when Myles and Katharine Weiss accepted the baton. In early 2017, ZLP’s format evolved with an eye to captivating viewers with shortening attention spans and appeal to cord cutters and others who watch programs via the Internet. With David and Kirsten Hart serving as studio hosts, our program now features a cornucopia of Messianic Jewish Bible teachers — fine scholars who, circumcised and bar-mitzvahed, have grown up in Jewish homes and attended Hebrew School. What this ministry offers now is the crème de la crème of top-drawer theological teaching from Bible experts who, above and beyond their already full-time commitments with Messianic congregations and humanitarian missions, are called to share their Biblical insights on Zola Levitt Presents. Meanwhile, all of the teaching from Zola, Jeff & Sandra, and Myles & Katharine is archived indefinitely at levitt.tv for free viewing, 24/7 on demand. This ministry’s supporters who gravitate toward familiar faces as our various guest teachers come and go will have a sense of continuity with David and Kirsten serving as hosts. As you probably have noticed, the Harts perform an Ed Sullivanesque emcee function of introducing veteran Bible teachers. ZLP’s new format appeals to Internet surfers as well as to restive channel hoppers by offering shorter segments of inspirational teaching and a variety of faces and places. Joseph: Dreamer, Redeemer From his humble beginnings to his ascendancy as a leader of the known world, Joseph pictures the One to come. Close Encounters with Yeshua This series focuses on how Jesus/Yeshua supernaturally came and ministered on Earth, and today calls all mortals to draw near to Him. David and Kirsten Hart introduce each episode from the studio, while Myles and Katharine teach in Israel. Called Together The Lord calls gentiles and Jews to work together to bring Messiah especially to the lost sheep of the House of Israel. From the studio, David and Kirsten present these programs that feature teaching from “Our Man in Haifa” Eitan Shishkoff. New Year 2018 brings more fine Messianic Bible teaching from the likes of Bible scholar Dov Schwarz, analyst Dr. Mark Hitchcock, Eitan Shishkoff, and others to be announced. Watch Therefore and Be Ready (early 2018) Eight episodes encourage today’s generation to be aware of prophetic fulfillment and stay ready for Messiah’s return. David and Kirsten introduce this series that features teaching from Dov Schwarz and uplifting music composed by Zola Levitt. Psalms of Ascent (summer 2018) Psalms 120–134 sung by Jews going up to the Temple in Jerusalem in ancient times are timely for Believers today. David and Kirsten present teaching by Jeff Seif from Israel, plus Marty Goetz’s Messianic singing. Our monthly Levitt Letter offers an array of Bible teaching and commentary that includes David and Kirsten’s articles of discovery. For four decades, ZLM has dispersed tens of millions of newsletters and other Biblical items across America, overseas, and among brethren in bonds. Did you know that more than 1,400 convicts read our Levitt Letter each month — and share them with their fellow inmates? For more than 30 years, our small outreach has been one of America’s steadiest, effective prison ministries. Tony Derrick’s Levitt Letter prophecy series on the End Times cut through speculation by collecting the Bible’s descriptions of each Last Days event and analyzing its timeline and participants. From September through December he covered the Rapture, the Tribulation and Israel, and the End Times battles of Armageddon and Gog & Magog. John Parsons’s Hebrew lessons in the Levitt Letter offer hearty Bible teaching and spiritual insights, such as “Cast Your Burden Upon the Lord” (June) and “The Gospel of Moses” (April). Lovers of archaeology appreciate each issue’s updates regarding finds at Israel’s dig sites, such as “Evidence of Jerusalem’s Destruction in 70 a.d.” (August) and “12th Dead Sea Scrolls Cave Discovered” (April). My own Wise As A Serpent series, dedicated to Christian stewardship, included “Surviving Equifax” (December) and “Wall Street — Still a Dark Alley” (September). Each Levitt Letter highlights recent Israeli scientific developments, such as “Overcoming Bacterial Resistance to Antibiotics” (August). Dr. Todd Baker’s Ask the Chaplain answers key questions such as “What does the Bible mean by “circumcision of the heart?” (October). We also take up Biblical commentary like “Five Reasons Why Israel Should Matter to Christians” (September). And we stand up for Zionism: “Myth: Jerusalem is Holy to Muslims” (August). Sometimes we address questions Believers forget to ask, like “Why Is Israel Called Israel?” (May–August). The Levitt Letter Bulletin Board features brief tidbits like “What Does the UN Do?” (January), “Who Occupies Gaza? — Not Israel” (September), and “‘Jews vs. Nazis’ Beer Pong” (October). To read about Tony Derrick’s journey from this ministry’s mail room to writer of theology, see “Our Ministry’s Abraham Lincoln” (March Levitt Letter). Tony earned a Master of Divinity from Criswell College in Dallas and served as Zola’s understudy while managing our Holy Land tours; he has risen to represent ZLM as a top spokesman. Over several trips in 2017, our To The Jew First benevolence fund sent thirteen missionaries to witness to Jews in the Holy Land. Dr. Todd Baker and other volunteers furnish monthly reports about working for the Lord in His Land. “Our Man in Haifa,” Eitan Shishkoff, shared anecdotes about living as an American Jew after making aliyah (going home to Israel) twenty-five years ago. His October Levitt Letter column, “My Journey with Hebrew,” contrasts his experience to Eliezer Ben-Yehuda’s (1858–1922), who brought Hebrew back to life when the Jews flocked to Israel in the 19th and 20th centuries. We’ll miss Eitan during his sabbatical. Beginning with the February Levitt Letter, John Wollinka took over ZLM’s graphics design when Don Day retired after working with us since the 1980s. While maintaining most of Don’s layout traditions, John incorporates the finest classic Biblical art that is relevant to each issue’s teaching. Consequently, most of our news magazines rival visits to art museums as well as seminary classes. This ministry’s monthly Personal Letter complements the Levitt Letter by offering lengthy, in-depth Bible lessons. If you missed Tony’s Personal Letter in August about why Believers should “Pray for the peace of Jerusalem,” please see it at levitt.com/levletter. His October Personal Letter authoritatively differentiates Law and Grace, helping readers overcome the popular misconception that keeping Mosaic Law is required for living a Godly life. Our website, www.levitt.com, may soon become our major means of distribution for news magazines and also our television program. Please take a moment to click on each of our homepage’s eight dropdown menus: Home, Zola TV, Levitt Letter, Zola Tours, Store, Donations, Information, and Discussion. The “Zola TV” tab opens to our Broadcast Schedule, Video Archives, and more. The “Levitt Letter” menu offers our newsletter archive and lets you subscribe to our free flash newsletter, The Levitt Letter Extra. Clicking on the “Donations” tab enables you to contribute cash, vehicles, gift cards, and assets such as stock and real estate. While many “cord cutters” are abandoning cable television, the airtime rates that our ministry pays to broadcast Zola Levitt Presents remain as high as ever. The Trinity Broadcasting Network (TBN) told us goodbye shortly after Zola “graduated.” Both the ION and INSP networks became too secular for us to stay with them. Our program remains on two networks — Freeform (formerly ABC Family) and Daystar — as well as on dozens of independent stations. Decreasing our broadcasts has unfortunately eroded our economies of scale, resulting in a monetary squeeze that could be our own Battle of Jericho. That is, unless God leads more of our viewers to step forward financially while making the transition to using Roku and other means to watch our “broadcasts” on the Internet. In the meantime, this test of faith is becoming a nail biter. This is where I ask you to prayerfully help us get back in the black with our necessary reserves so that we can maintain our high standards of television production and news magazine creation, offering them free of charge to anyone interested. Rather than announce an immediate crisis, I am requesting that many of our supporters please concentrate their giving on our small, efficient organization rather than on larger ones who are better at fundraising than at Bible teaching. To express this sentiment another way, I offer fair warning that we have no more fat to trim in terms of overhead and discretionary expenses. If it is God’s will for this outreach to change how we do what we do in terms of scale, I won’t be squeamish about downsizing. So this is me plainly and clearly asking for your renewed commitment to contribute funds and prayers now and through the new year if you cherish our Bible teaching as much as we do. P.S. As you may recall, fundraising accounts for only 0.65% (less than 1%) of our expenses. Still accredited by the Evangelical Council for Financial Accountability (ECFA), this ministry delivers solid, Messianic Bible teaching and commentary via television, bulk mail, and the Internet. Now more than ever we need your ongoing help. Kirsten and I grew up in church our whole lives. We have seen tithes and giving used well, and we have observed misappropriations of funds. We can assure you that when you give to Zola Levitt Ministries, not a penny is wasted or used for anything other than ministry purposes. In a world where excessiveness is rampant, ZLM is the epitome of wise thriftiness. We appreciate Mark’s insights in this letter. He follows in his father’s wisdom. He is also mindful of prioritizing ministry over asking for funds. ZLM and ZLP consistently focus on supporting Israel and teaching the Jewish roots of Christianity as well as the Gospel of Yeshua as prophesied in the Old Testament. That was Zola’s calling and heartbeat until Yeshua called him home. Our faces are new to you, but this ministry remains true to its original passion. In continuing Zola’s legacy, ZLM daily fulfills prophecy. When you uphold our work for the Lord with your financial and prayerful support, you fulfill Scripture. What greater gift could you give this world? I love verse 27 from Romans 15. If you’re reading this letter, you have shared in the Jews’ spiritual blessing! What better way to connect with them than to go to Israel and invest in the Jewish people there! It’s a win-win situation. You get to participate in the spiritual blessings and give back to God’s Land. The sooner you’re ready to go, the more likely we’ll have openings for our Spring Tour (see dates and contact information below). However, if you need time to prepare, please plan to join us this fall. Your spiritual life will improve markedly; we guarantee it. Plus, a trip to Israel is really fun — it’s a vacation and a study pilgrimage in one. We’ll save a seat on the bus for you! Zola Levitt Ministries continues to lift up many other Jewish ministries in Israel as well as bring you on-location Messianic Bible teaching from the Holy Land. Blessings to you and your family in this New Year, and thank you for supporting this outreach with your prayers and donations. David and Kirsten present this encore series featuring the teaching of Dr. Jeffrey Seif. Even with Haman gone, the Jews still had to defend their homes and families. God turns our mourning into joy: The Jews are bidden to commemorate God’s saving power in an annual celebration, Purim. Watch Therefore and Be Ready Eight programs encourage today’s generation to be aware of prophetic fulfillment and be ready for Messiah’s return. David and Kirsten present teaching from Israeli Messianic Dov Schwarz, with guest analyst Dr. Mark Hitchcock, reports from Israel by Chaim Malespin, Hebrew lessons, and music written by Zola. The foundation of our faith is unbreakable, unshakable covenant. God made His New Covenant (found in Jeremiah 31) with Israel. Gentiles have been grafted in to the olive tree. Count me in! I will support the high quality of the ministry’s Bible teaching on Zola Levitt Presents, in the Levitt Letter, and at levitt.com. How do the Scriptures touch on the relationship of Jews and gentiles at the end of the age? Messianic Jewish pastor Eitan Shishkoff focuses on friendship as the answer. Called Together focuses on how gentile Christians are recognizing their Messianic brothers and sisters (Jewish believers in Jesus/Yeshua) as the natural olive branch Paul referred to in Romans 11. The Lord calls us to work together to bring the Messiah especially to the lost sheep of Israel. Copyright © 2018 by Zola Levitt Ministries, Inc., a non-profit 501(c)(3) organization. All rights reserved. Brief passages may be quoted in reviews or other article. For all other use, please get our written approval.